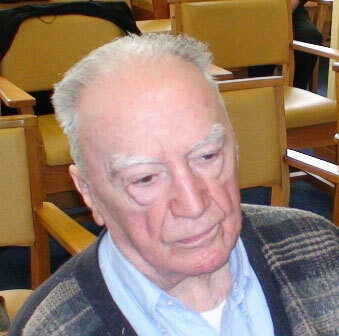 The Society of African regretfully announces that Fr Sean MacCarthy SMA died peacefully in the Mercy Hospital, Cork at 1am on Friday, 23 December 2011. He was in his 90th year, born on 19 February 1922, in Mary Street, Cork. Fr Seán’s remains will be received at the SMA House, Blackrock Road at 5.30pm Friday. After prayers at 11am on Saturday, 24 December, his remains will be taken to St Joseph’s SMA Church, Wilton for Concelebrated Requiem Mass at 12 noon followed by burial in the adjoining community cemetery. The third-born child of Christopher and Catherine (neé Allen) McCarthy he is survived by his older brother Paddy and a sister Maureen. Two other sisters, Chrissie and Patricia and three brothers, Peter, Derry and Declan predeceased him. Seán attended the Christian Brothers in Sullivans Quay (1934 – 1938) and the North Monastery (1938 – 1941). After his Leaving Certificate examinations he followed in the footsteps of his father and sister Chrissie by entering the Irish Civil Service. A year later he decided to follow his missionary calling and entered the Society of African Missions where he began his studies at the SMA Novitiate in Cloughballymore, Co Galway. From there he moved to the African Missions Seminary at Dromantine, Newry, Co Down. He became a permanent member of the Society on 16 June 1947 and was ordained a priest on 13 June 1948, one of fifteen ordained on that day by Bishop Eugene O’Doherty in St Colman’s Cathedral, Newry. Seán is the last of his class to go home to God. From his earliest years with the SMA, Sean Mac Carthy was recognized as a man with a keen intellect and intelligence. In line with the Society policy of the time of ‘evangelization through education’, he was sent, after ordination, to Cambridge University in 1948 where he attained a primary degree and was awarded a Masters in 1955. During this period he spent some years on the teaching staff of the SMA Minor seminary, Sacred Heart College, Ballinafad, Co Mayo. In the 1980’s Seán undertook a Doctoral study of the Concept of Colour in the Philosophy of the British mathematician and philosopher, Alfred North Whitehead. Sadly, due to ill health this work was never submitted though it had reached its final stage. In 1954, he set sail for Nigeria where his first appointment was in the Teacher Training College at Akure, in the then Ondo-Ilorin Prefecture. Two years later he was appointed to Annunciation College, Ikere-Ekiti. As its Prinicpal, he ran an extremely efficient school which, year on year, was top or near the top in all subjects when State exam results were announced. In 1968, the SMA Superior General invited Seán to be part of the Secretarial team at the 1968 General Assembly in Rome. Following this, he stayed on in the Generalate Secretariat as Anglophone Secretary. A year later, 1969, Seán was invited to join the staff of the English Africa Service of Vatican Radio where he served with distinction until 1988. On 1 January 1972, he was appointed Head of Programmes in English at Vatican Radio. He stepped down from that position in August 1988. For nearly twenty years Seán’s soft Cork accent was the voice of the Vatican for all those listening throughout Africa for news of the Pope and the work of the Church. He accompanied Pope Paul VI and John Paul II on many of their overseas trips. It was as a result of some illness he picked up when on a trip to Asia with Pope John Paul II that Seán retired from Vatican Radio and retired in the SMA Generalate in Rome where, amongst other things he began his Doctoral Studies. Among his interests, Seán loved Scrabble and he had a loyal band of ‘Scrabblers’ in Rome. On many nights he would head off in his white CinqueCento car to visit some house where a game was waiting his presence. Seán loved Rome and was a most loyal servant of the Church. Once, when quoted as a source for a particular author, writing about the death of John Paul I, Seán expressed his unhappiness about this as he had never spoken to anyone on the matter. But he took it no further. He stated the truth of the matter and left it at that. In the SMA Generalate, where Seán would return each evening after work, there was no tittle tattle about the goings on in the Vatican. He was a quiet man, who kept his thoughts to himself. Seán also loved his native Irish language and wrote several poems in Irish. As a young man he was a good boxer and, in the opinion of some, could have won Irish National titles at his weight. However, as a seminarian, he was unable to pursue this goal. In 2000, due to increasing ill health, Seán retired to the African Missions, Blackrock Road where he lived until his death, participating in the community religious services right up to his death. He is mourned by Paddy and Maureen, his surviving brother and sister as well as nephews, nieces and friends and his confreres in the Society of African Missions.